Nothing got the adrenaline flowing as a kid than crawling around an old abandoned house or factory. The world is full of deserted sites, some of them comprising the ever-changing top ten lists of creepily beautiful places. To me, broken cities are often reminders of broken humanity. It is the stuff of dystopian tales and you don’t have to go far to see what it looks like. My fascination of places where corners are defined by shadow, comes from an old Victorian house I grew up in as a child. Built around 1900, its three-story temple of dark wood, creaky stairs and a catacomb basement was a sanctuary for a loner kid who liked to feel his skin crawl. 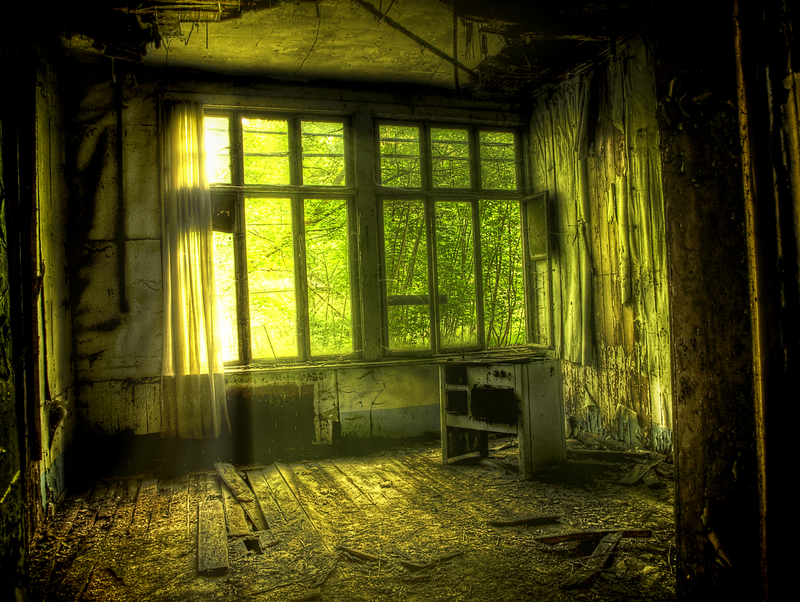 Adolescent years in rural Connecticut discovered dozens of abandoned homes to risk life and limb on rotted floors. It always fascinated me how these places could stand relatively unchanged for decades. I would not realize until later that it was just cheaper to leave it be. Deserted towns pepper in abundance the US landscape, a heritage of our wild mining days or cattle towns romanced in tales of the old west. For a while, it seemed our riverfronts would become a cemetery of brick and metal, until growing urban renewal discovered convenient shells for condos and shops. Some places have a more ominous reason for its status as a ghostly haunt. Chernobyl and Fukushima make great backdrops for an apocalyptic setting. Centralia, Pennsylvania, could be the poster child of excess, with its smoldering sinkholes amid a crumbling town from an underground coalmine fire that is still burning today. Occasionally, a place becomes a reminder of how broken society can be. The town of Ovadour Sur-Glane in France, is an eerie tombstone of rubble’d houses, left as a memorial following a Nazi massacre in 1944. Lost civilizations are today’s tourist havens. We pay big money to walk in the ruins of once mighty nations. Greece, Egypt, Rome, Mayans, Middle-East, the list is lengthy for that which is not buried beneath the foundations of its conquerors or ashes of nature’s fury. What goes through your mind when you feel the crunch of antediluvian pebbles beneath your feet, or smell the musk of ancient structures? Do you think it just a hollow reef of our passing left abandoned, or are you awed … humbled … maybe a little bit frightened of how fast it happened. Now imagine a future where broken spires of man’s inhabitance are the norm, not the exception. Check out Francesco Mugnai’s take on some of the more haunting, broken places ever photographed, places where an echo is the only sound you’ll hear. Kind of gives me that skin-crawly, shuddering sensation, like discovering a spider on my neck. Interesting post, DT. Have you heard about the dozens of totally empty cities in China? From what I understand, investing in property/real estate is virtually the only means of investment for the citizenry so they are building homes, apartment buildings, malls, etc that are all standing empty. The average household can’t afford to rent or buy what has been built. Talk about a dystopian paradise, no? Wow, some of those images are haunting, DT. And some make me want to be there. For me, it depends on where it is as to what the decrepit state stirs in me. In Scotland, I love the abandoned spaces, and it saddens me to see them go away crumble by crumble. But in places that were ruined by war, where the scene still rings with death and turmoil, it’s as if they are truly haunted and even the living can’t find peace. Civilizations have come and gone through the eons, and to walk among the broken fragments fills me with pensive melancholy. Imagine the many societies still buried beneath the pavement of modernity, unknown but to a few scholars. Ruins should be lessons to us, not just skeletal remains to photograph and go for pizza. Thanks Liv, for your thoughtful comment. An excellent observation, Cadence. China is noted for moving entire villages and towns to make way for those buildings and malls. They have come a long way since the Cultural Revolution that nearly erased a civilization dating thousands of years, and it takes time to eradicate the deep-rooted corruption it spawned. Dystopian story societies favor autocratic socialism, a natural premise that arises from chaos and destruction. Good example, and thanks for stopping by.